The great thing about Setting Up An Aquarium is that you can start simple and then grow to more complex Aquariums as your knowledge increases. Coldwater and Tropical Freshwater Aquarium are the best systems for beginners. Tropical Aquariums are relatively cheap and Tropical Fish are usually hardy. Marine Aquariums, with Saltwater Fish, are more expensive and you will need a lot of knowledge and good techniques from the outset. Aquarium Cleaning:Carefully clean the inside of your Aquarium with clean tap water, checking for leaks whilst doing so. There are lots of Aquarium Cleaning Tools designed to help with this task so as to prevent any scratching or damage to your new Aquarium. Then empty the Aquarium of the tap water. Wash the Aquarium Gravel:Place the Aquarium Gravel in a bowl and place under cold running tap water. Keep stirring the Aquarium Gravel until the water that flows from it is clean as it pours over the side of the bowl. Stir the Aquarium Gravel around vigorously to make absolutely sure you get it as clean as possible. 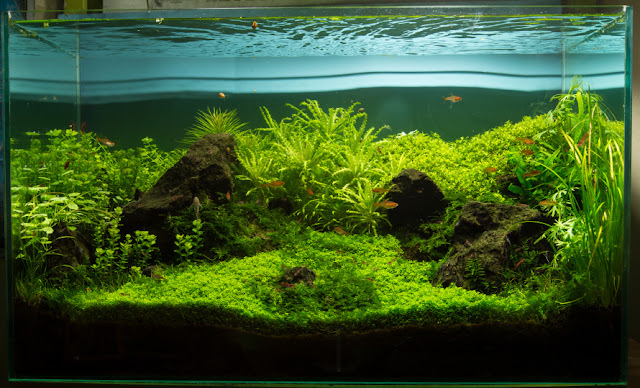 Aquarium Decorations, Ornaments and Aquarium Silk Plants:Wash any Aquarium Ornaments, Silk Aquarium Plants, Plastic Plants and Aquarium Rocks thoroughly using cold running tap water. If you have an Aquarium Background ensure that it is securely fitted to your Glass Aquarium. Make sure there’s a depth of 4 cm over the base of your Aquarium. Fish Fish Fish recommend using Hugo Kamishi Gravel or Seachem Substrate (if using live plants). Do not fill your aquarium with water at this stage. Add your cleaned Aquarium Decorations, Ornaments and Aquarium Silk Plants or real Plants:Make sure they are securely placed and use your gravel or substrate to help secure them in position if required. It is best to put your taller Aquarium Plants at the back and your smaller Aquarium Plants and Décor at the front where they can be seen. For ease of maintenance, Fish-Fish-Fish recommend using Artificial Plastic or Silk Plants such as those in the Hugo Kamishi or Biorb range as they look very realistic in most sized Aquariums. If you use Aquarium Rocks as Aquarium Décor, make sure they are firmly bedded in so that they can never topple and damage other ornaments or the Aquarium. Now you can your conditioned tap water to your new Aquarium all the way to the top:Watch out because if you fill it right to the brim, then later you want to change the arrangement and put your hands in and the water overflows- whoops! Important!! Condition the water:Before adding any Fish to your new Aquarium you MUST remove the chlorine from the tap water. Tap Water Conditioner is readily available and is essential when adding tap water to your aquarium (see Aquarium Maintenance). Chlorine/Chloramine can damage your Fish and Fish-Fish-Fish recommend Seachem Prime for conditioning your Tap Water. Before adding any Tropical or Cold Water Fish:You must let the Aquarium Filter run for 5-7 days before adding Fish to your Aquarium (sorry ! ). It is essential you let the Aquarium ‘settle’ first. You may notice that there maybe a lot of ‘bubbles’ clinging to your Glass Aquarium during the fist few days. This happens because cold tap water is pressurised and as the cold tap water warms in your Tropical Aquarium natural gasses are released. There is nothing to worry about, let these cling onto the Glass Aquarium as they will disappear when aerated. Make sure that the Aquarium Heater is set correctly, at about 26-27 degrees Celsius. After 5-7 Days – Add your Fish!! :It is best to add Aquarium Fish Stock a couple of Fish at a time. Use the “Equalising Method”. Leave your Fish in the Fish Bag in which they were purchased. Open the Fish Bag and leave floating in your Aquarium Water for approx 30 mins. Then gently add some of your aquarium water into the bag by tilting the bag and leave for a further 20 minutes. This allows the water temperature in the Fish Bag to reach the same water temperature as your Aquarium Water and also allow the water quality to adjust. A swift change of water temperature is very stressful for Fish. Moving Fish is very stressful to them too, so take great care in handling them. Once the 50 minutes has passed then you can allow your fish to enter your aquarium by gently tilting the fish bag and allowing them to swim out. Adding more Fish to your Aquarium:Before adding more Fish make sure your existing Fish living in your Aquarium are happy and healthy. Before adding Fish to your Aquarium, it is a good idea to do a Water Quality Test for Nitrite. If your Nitrite level is reading high it is best not to add any more Fish to your Aquarium until the level has reduced. Fish-Fish-Fish recommend Hagen Nitrite Test Kit for this. If your nitrite levels remain high, please phone Fish-Fish-Fish for advice. When the Nitrite level in your Aquarium is okay you can add more fish. Fish-Fish-Fish always suggest adding a couple of fish at a time, take things slowly as there is no rush! You must not over feed Fish. 1 small pinch of food every other day is sufficient when setting up a new Aquarium. More Fish Food Feeding will be required once your Aquarium is well established.